Vancouver is located in the Southwestern corner of British Columbia; on the coast of the Pacific Ocean. It is overlooked by the Coast Range Mountains and surrounded by water on three sides. The Greater Vancouver Regional District (GVRD) has everything from Beaches, mountains and 192 beautiful parks to a cosmopolitan downtown area, fabulous shopping and entertainment. Due to it's location it has a mild climate, which means not too much snow in the winter and pleasant temperatures in the summer, but it does to tend to have a lot of rain. The average annual rain and snow fall is 1219mm. As Canada's third largest city, the downtown area has a population of 514,000 (1996 census) and the GVRD has a population of almost two million. It is a city of newcomers, according to the 1996 census 45 percent of residents were immigrants. The best downloadable guide book for tourists or new residents we have found is - Frommer's GVRD and Victoria 2004 full of great information available over the net! According to international surveys, Vancouver is one of the best cities in the world for quality of life. It is also ranked, along with four other Canadian cities, as one of the safest cities in North America. If you are looking to move to the Vancouver area, Sue and Frank Gerryts offer a complete relocation service to help ensure a smooth process. As licensed realtors with a broad network of reputable professionals to assist you, let them take the stress out of your relocation and help find you the right accommodation. 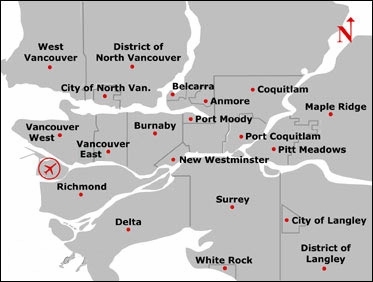 The Greater Vancouver Regional District comprises 21 seperate municipalities - detailed information for each of them can be found by following the links below the map. The actual city of Vancouver itself is made up of 23 different Neighbourhoods each having its own distinct character. The main drawback about Vancouver is the very expensive Housing and Rental Market. Nearly all areas around the city are either very costly to buy a property or a long commute to work. There are many wonderful Places to visit, shop and eat in. This includes a vast number of galleries, sophisticated shopping and antique shops to choose from. A great information packed site is the Vancouver Bc Canada Guide which I'd recommend for tourists or newcomers alike! Chinatown is one of the largest in North America and is a thriving commercial and residential district. Gastown is the historical part of the city with cobblestone streets, heritage buildings, shops, restaurants and galleries. It's located just south of the harbor and is a vibrant place. Located just under the Granville Street Bridge is Granville Island Market which offers a mix of food, arts and crafts, shopping and theatres. Stanley Park, located close to downtown, has over 1000 acres of forest and is a firm favorite with both locals and tourists. The park has many kilometers of pathway, an aquarium, a pitch and putt golf course, a miniature railway, tennis, restaurants, beaches and on summer evenings live theatre. Robson Street is in the heart of downtown and offers boutiques, side walk cafes, shops and restaurants. The city has many tree lined streets and no highway cutting through the city so walking is encouraged. It is illegal to cross the street anywhere but an intersection in the city. Public Transport system which consists of buses, Seabus, Skytrain and a commuter rail service called the West Coast Express. This is an integrated system and you can use the same tickets for different modes of transport. There is also an extensive system of bikeways, so cycling is another good way to get around. The Port of Vancouver rates number one in North America in total foreign exports and is the gateway for Asia-Pacific trade. It has a natural deep water harbor and covers 233 kilometers of coastline. In 2003 its total cargo traffic was 66.7 million tones. The Port is also home to the Vancouver - Alaska cruise, one of the worlds most popular cruises. There are many attractions in and around the city offering a wide variety of activities. Grouse Mountain located just 15 minutes from downtown, also known as the Peak of Vancouver. Riding the Gondola to the mountain top is an absolute must, in the winter you can experience the skiing, snowboarding, snow-shoeing, ice skating and sleigh rides and in the summer mountain bike tours, helicopter tours, tandem paragliding or maybe just enjoy the magnificent views at one of the restaurants. Science World located on Quebec Street offers hundreds of interactive exhibits, wrap around movies in a giant theatre and year round special events. There are always new exhibits arriving so it never gets boring. Capilano Suspension Bridge and Park located 10 minutes from downtown is the city's most popular visitor attraction. The swaying footbridge bridge is 230 feet above the Capilano River and spans 450 feet. There is also a colorful Totem park, trails through the West Coast rain forest and much more. Vancouver Zoo is located in Aldergrove just off the Trans Canada Highway. They are open all year round and offer either daily admission rates or season passes. There is a miniature safari train and a safari bus tour, you can also hire quadra cycles or bring your own bikes, in-line skates or any motor-less transportation to get you around. The city Aquarium is situated 5 minutes from downtown in Stanley Park. They are a self supporting and not for profit group and are Canada's leading aquatic conservation organization. Open year round they have many different types of marine life to learn about and a daily schedule of shows.